Seven for a Secret is the second book in the Timothy Wilde Series by Lyndsay Faye. Six months has passed since the events of Gods of Gotham. It followed the same pattern as the first book in the series: same point of view, another horrific crime, and a bunch of sass from Valentine. The characters were consistent into this book as well. I still hate Silkie Marsh with the fire of a thousand burning suns. The brothers seemed to have mended some fences since last we saw them. In fact one of my favorite bits about this book was the relationship between Timothy and Valentine. Their snipping and sarcasm toward one another was enjoyable, but it was easy to see the two cared for each other. And, Mercy Underhill wasn't present during this story, which to be fair is a personal preference. She is a well written character, like all of Faye's characters, I just find her whiny and annoying. However, there is a reason for not being able to give this book a whole 4 stars. The closer I got to the ending, the more I realized I was pulling away from reading. It wasn't just because this story was coming to a close and I wasn't ready, there is in fact another book. I sort of felt like the story started to drag along. Like Timothy hadn't learned anything from his first case and was making all the same mistakes all over again. Which was fine when he was a brand new Copper Star, but it's been six months. Maybe I'm being a bit judgmental about it. Then we get to the climax of the story. Timothy has figured it out and he's running against the clock to stop it. Only when he gets there it's all over, the thing has happened and he's left with the aftermath. Why? Because of reasons due to political things that I still don't really understand. They blame him of harassing someone, but I feel like I missed the chapter where he actually harassed this character. The upside to the political upset, we get to Valentine in all of his Dead Rabbit glory. Which was awesome! I still would have liked a bit more during the climax of the story, though. To be fair to the author this issue might be more my personal preference. As for the every end of the book, I was reeled back in. Just like in the first book, Timothy manages to get one over on everyone who deserves it: the party, Silkie, and even on Mercy. I do adore Timothy Wilde as a main character and was glad he stopped pining and found a lady friend. He deserves a bit of happy. 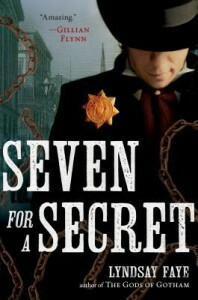 Seven for a Secret was beautifully written of course. Lyndsay Faye did a huge amount of research into the time period and it shows throughout the book. It was hard to not see the streets that the characters were roaming, to feel the atmosphere around them as they tried to solve the crime. She has a way of making characters tug your heartstrings until you fall in love with them, or writes them in such a way you cannot wait until they die. Both books have made me very glad not have lived back then for some petty reasons, like plumbing and heating. Among bigger issues that sadly still seem to be an issue today. In the end I did like the second book in the Timothy Wilde series, but I don't think I'm going to jump into Fatal Flame, the third book. For two reasons, it is the last book in the series and I just didn't enjoy this one as much as Gods of Gotham. So I'm little apprehensive to jump in again. I do recommend this series for anyone looking for a fun Historical Fiction book, or for anyone who enjoyed Gangs of New York.